If you are having difficulty bathing or using the toilet, bathroom devices may help. Be sure to read the equipment overview first. These devices are designed to help you bathe and shower more safely and comfortably. They include shower chairs, tub transfer benches, tub sliders with swivel seats, and grab bars. 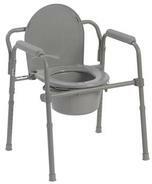 Commode chairs, raised seats, safety frames, and portable urinals are used on or in place of toilets. They are designed to help you be safe, comfortable, and more independent.